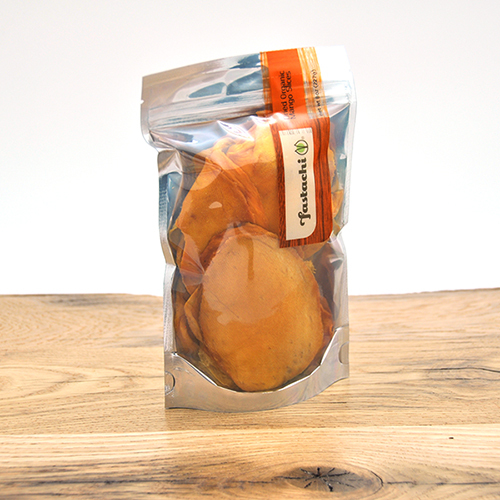 Our luscious organic dried mango slices are bursting with mouthwatering, sweet, rich and vibrant flavors. No added sugar, sulfur or artificial additives, these mango slices are rich in vitamin A, vitamin C, vitamin E, fiber, plus iron, nicotinic acid, potassium and anti-oxidants. They also contain an enzyme with stomach-soothing properties similar to the papain found in papaya. Whenever you're craving something sweet, delve into these chewy, bursting with flavor organic mango slices. NUTRITION FACTS: Serv. Size: about 1/4 cup (40g). Amount Per Serving: Calories 110, Total Fat 0g (0% DV), Sodium 1mg (0% DV), Total Carb. 28g (9% DV), Fiber 2g (8% DV), Sugars 20g, Protein 2g, Vitamin A (2% DV), Vitamin C (4% DV), Calcium (2% DV), Iron (2% DV). Not a significant source of Fat Cal., Sat. Fat, Trans Fat or Cholest. Percent Daily Values (DV) are based on a 2,000 calorie diet. These are the best mangoes I've ever tasted. To find something this delicious grown organically without sulfur dioxide or added sugar is rare in my experience. The flavor is sweet overall with a touch of tangyness, without any odd aftertaste that sometimes occurs with some dried mango slices. The texture is tender and easy to chew without any toughness at all. I am so pleased with the consistent flavor, texture and thickness. I will definitely order these again.